Here is Our Letter of Authenticity. 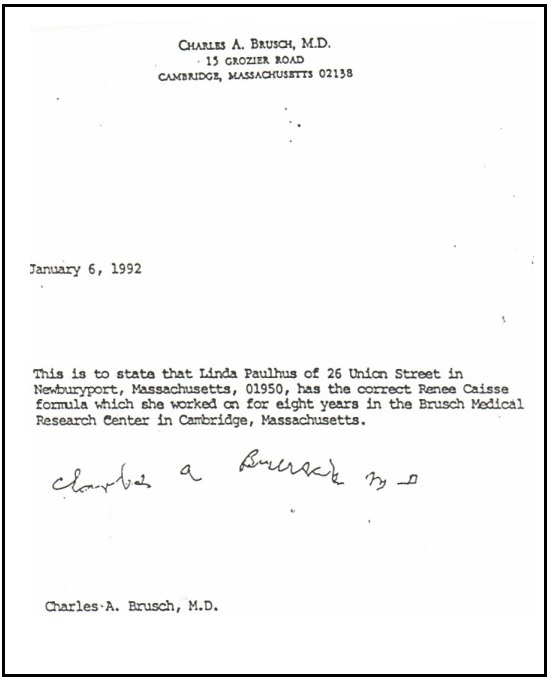 This letter of authenticity demonstrates our connection to Rene Caisse's research assistant, Dr. Charles Brusch. 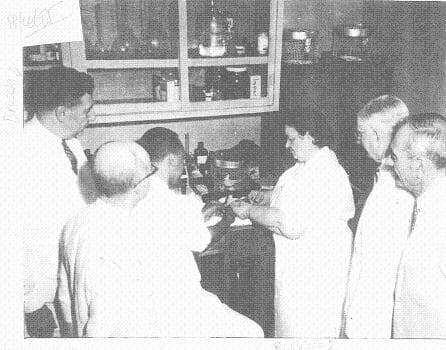 Here is Dr. Charles Brush, shown on the far left, with Rene Caisse. They are in the process of conducting research at the Brusch Medical Research Center in Cambridge Massachusetts. The most extensive research ever performed on essiac tea was conducted by Rene Caisse and Dr. Charles Brusch in Cambridge Massachusetts from the years of 1959-1967. Did you know--Caisse's name, spelled backwards, is 'Essiac.' That is how the tea got it's name. This research performed in Cambridge MA closely examined the properties of the original four herb formula and sought to improve upon it with the addition of four more herbs. This research resulted in a superior eight herb formula which is the formula that Rene Caisse ultimately endorsed. Our family lives 45 minutes from this research facility. We became friends with Dr. Brusch through a common friend named Arthur David. He is the one who referred our family to the essiac tea formula back in 1986. It worked so well for our needs that we ended up referring many others to the formula. We also began holding weekly meetings for other essiac users. By 1992 this group had become so large that it began to garner attention and was featured in an episode of "The Cathy Burnham Show." Following the release of this episode there was increased demand for essiac tea. Dr. Brusch knew that this increased demand combined with his advanced age meant that he needed to designate someone else who could continue providing essiac tea at the best price to as many people as possible. The letter of authenticity above confirms his wishes to pass on the formula to us in order to carry on his mission. This is the same mission that we carry on today. Here is our most popular product: The six month supply at aggressive dose. Rene Caisse herself mentioned that a person needs to take essiac every day for at least six months to find out the true potential of essiac. This product is a great deal as it lasts for six whole months and you will save on shipping ordering this quantity at once.